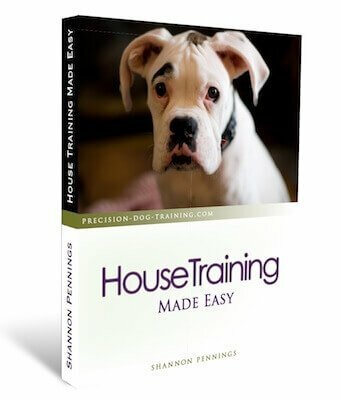 For dog owners who do not see the benefit of dog training classes, the number one reason I hear is that they can train their dog just as well at home. Sounds great, but is it really true? The majority of owners don't have the knowledge that a professional trainer does, so training can become frustrating for both the owner and their dog! And frustrated owners are more likely to give their dog up to a local shelter or SPCA. According the Hamilton-Burlington SPCA website, the most common reason people choose to give up a dog is a behavior issue that could have been corrected by proper training! There are solid pros and cons for private training as well as dog training classes. In general though, I find that both puppies and adult dogs do best in a group setting. Whichever type of training you decide is best for you and your dog, take your time choosing the right trainer to work with. A good trainer will have the heart of a teacher, who will explain everything to you as you go. That being said, in the end it really is up to you to do the work and practice the training every day with your dog. Dog training classes allow your dog to learn to obey under any distraction - many dogs around him or her, new humans, a new environment, and so on. This is by far the most important advantage to a dog training class. This is not to say that if a dog is obedient in class he will listen to you at home, though, unless the training is reinforced at home, too! I can always tell if someone will take the training home with them if they heel their dog all the way to the car at the end of class. Those folks who let the dog lead them back to the car, because "class is over now"? Um. Yes, they are usually scratching their heads as to why Fido won't heel at home! I rest my case. 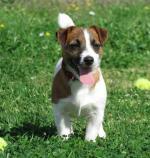 For many people, price also plays a part in the decision what type of dog training to use. Dog training classes tend to be more affordable than private training, for obvious reasons. The only thing you need to watch for is the size of classes... ask to view a few classes and take note of the ratio of dogs to trainers. You don't want to be stuck in a class of 20 dogs with only 2 trainers to go around! You want to see mayhem? The main problem with this "at home" training is the lack of distraction. Typically, you don't have more than two dogs at home, and if you do have multiple dogs, they are not "new" dogs - thus they are not nearly as interesting and distracting as a room full of new dogs! That being said, at home or private training can be the best route to go when training certain "special needs" dogs, such as those who are blind or deaf. As they don't have all of their senses, it's helpful to start out training in a quiet, distraction-free area where they are comfortable. What??? OK, maybe I'm exaggerating a bit, but only a little. Truly, this is how it feels when you just know that your dog is going to freak out and try to eat little Sally's miniature poodle. So it would be tough for this owner to be thrown in a room full of other dogs right off the hop! In this case, it's easier to build the owner's confidence in controlling their dog in a private setting first, and then adding distractions later. So you've decided that dog training classes are the way to go for you, but you aren’t sure which direction to head. With all the information available, you are tempted to just close your eyes and point at an ad in the yellow pages, and hope for the best. Wait! Do yourself a favor, and find out as much as you can about the method taught at the training school you’re looking at. It would be a waste of your time and money to find out at the end of the course that the techniques and methods taught haven’t solved your dog’s problems whatsoever! So you've decided that dog training classes are the way to go for you, but you aren’t sure which direction to head. With all the information available, you are tempted to just close your eyes and point at an ad in the yellow pages, and hope for the best. Wait! Sit in on a few classes (try to watch a class that is at the beginning of their course, and another one that is at the end of the same course to really see how effective their training is!). I teach and recommend what is called balanced dog training. My dog, Justice, was trained with this method as well. As a certified dog trainer, I don’t endorse anything that I haven’t already or wouldn’t use to train my own dog. Unsure about something I’m telling you? 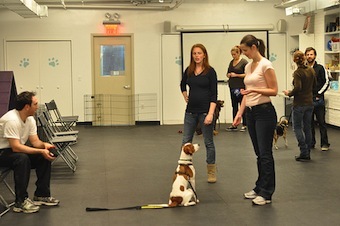 Don't worry - I give a reason for everything that I do in dog and puppy training. And so should any trainer that you work with! Now that you know more about what dog training classes can do for you and your dog, you are able to make an informed decision on where to take your older dog, rescue dog, or puppy for obedience training and advice... that's right - to a certified balanced dog trainer in your area!